One of the things I enjoy most about reading comic books is speculating about what happens next. Sometimes what comes out of this process happens, sometimes it’s better that it doesn’t. Regardless, my favorite titles have kept me coming back for a long time. Earlier tonight, I was thinking about Marvel‘s Amazing Spider-Man comic and what’s been going on for the last few years. I’ll recap some of the history and then get into what might be next, but first I want to warn anyone that might not want read any of this to turn away. I’d hate to waste your time or disappoint you if any of this happens. As a disclaimer, I just want to point out that I do not have any advanced knowledge of the future. 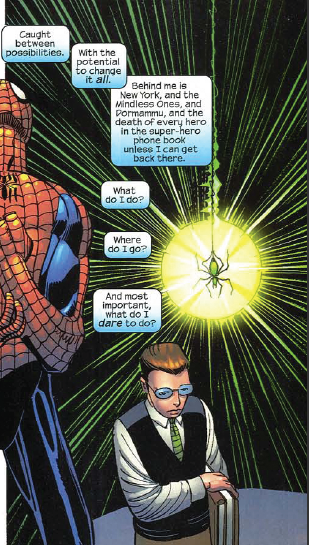 The story so far: Peter Parker is the Amazing Spider-Man. In his first comic book adventure, Peter decided not to stop a criminal who went on to shoot and kill his Uncle Ben, who along with his wife May had raised Peter since the death of his parents. Peter has been married to Mary Jane Watson since 1986 and has loved his Aunt May since 1963. During the Marvel Civil War, Peter made a series of bad choices ultimately leading to his publicly unmasking as Spider-Man. 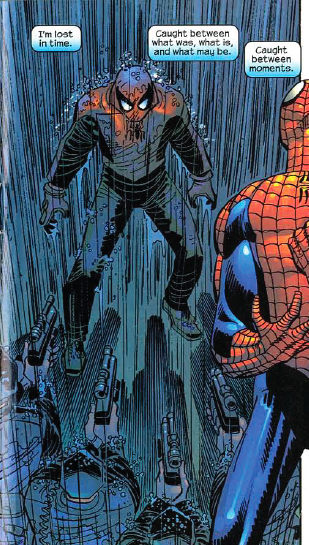 His family was placed in grave danger and an assassin’s bullet meant for Mary Jane fatally wounded Aunt May. Peter tried many things in an attempt to save her, but nothing worked. He was eventually approached by the demon Mephisto and offered the choice of trading his marriage and love for Mary Jane in exchange for May’s life. Believing that Peter would not be able to live with the guilt of May’s death, Mary Jane accepts the Faustian pact and we are taken to a world where they never married. Additionally, Peter’s identity as Spider-Man is once again secret and his long dead friend Harry Osborn is alive and well. Since this story, we’ve been introduced to a slew of new villains, new love interests and new pitfalls in Peter Parker’s life. While it was assumed these new conditions were the result of Mephisto’s deal, there have been hints that everything is not as it seems. Peter has no recollection of the deal, but he knows that his identity was put back under wraps and he was directly involved. Harry’s return was chalked up to his being hidden in Europe by his father. Mary Jane is back in the picture as well, but it seems that she may remember all that has transpired. The deal with Mephisto and the magical erasure of the marriage are hot button issues among fans. Marvel has promised that we’ll find out what happened on their wedding day this year. At the time the deal was going down, I remember having an idea that something crazy was going to happen to stop it. In Amazing Spider-Man #500, Peter saw a vision of himself in the future where he was on the run from the police and making his last stand at Aunt May’s gravesite (I refer to him as “Last Stand Spider-Man”). This image remained with the Peter of the present, and he clearly saw that his life could completely fall apart around him. I was sure that Last Stand Spider-Man was going to swoop in and stop Peter from making the deal. I was even convinced that it was his glove on the cover of the last issue of One More Day. No such luck. I’m now thinking he (or someone else for that matter) could still save the day. Let’s say that Last Stand Spider-Man knows that the deal will hurt everyone and lead to his future, but instead of stopping the deal when it’s offered to Peter and Mary Jane, he stops it from ever being offered in the first place. What if he stops the marriage from happening at all? There would be no deal to offer up. This would allow Marvel to keep their number one hero from having made a deal with a devil, and keep him single, which seems to be their intention. If the marriage never happened as we’re now being told, and we haven’t seen the entire story, it’s entirely possible that time travel is part of that story. Admittedly, it’s not very likely, but I think about these things when Angie’s not around. I’m sure there are dozens of reasons why this could or should not happen, and I’d love to hear them.